Nerf is timeless. There’s a good chance that you’re looking for a Nerf gun for your daughter or son, niece or nephew, or perhaps even for yourself. That’s because Nerf is fun for all ages, and it’s an indoor/outdoor toy that most families can’t live without. We scoured the internet in search of the 12 best Nerf guns, and what we found might surprise you. With a number a price ranges, styles, and series to choose from, you’re going to find that this buyer’s guide will steer you in the right direction. Looking for the best budget-friendly Nerf gun? Look no further than the Nerf N-Strike Elite Triad EX-3 Blaster. This is an excellent Nerf weapon for kids 8 and up. Conveniently holding 3 Nerf darts, this gun will allow you to hit your target at distances up to 90 feet. This Blaster is small enough to conceal in your pocket and rests easily in the palm of your hand. Easily reload with a single plunge. All in all, if you’re looking to add a new Nerf gun to your arsenal, and you don’t have much money to spend, the Nerf N-Strike Elite Triad EX-3 Blaster is the right choice. The name itself is cool, but the gun is even cooler. There are some unique design features to this gun that make it stand apart from the rest. It will hold 8 darts, with two on each side. The gun is large in size, yet still lightweight and easy to carry. Enjoy the chainsaw blade spinning feature that looks super cool and doesn’t even require batteries. With your purchase, you receive 9 foam zombie strike darts, and the gun is suitable for ages 8 and up. If you’re looking for a super cool gun that is easy to use, this is the answer for you. Looking for a gun to impress your Nerf buddies? This is the answer. The AccuStrike Raptor Strike comes from the famous AccuStrike series. Enjoy bolt-action precision shooting with 18 AccuStrike darts. There’s an extendable bipod that helps to stabilize the blaster, and a cool pop up sight that gives you the ultimate in precision. With your purchase you’ll receive 18 darts, a 2-piece bolt, bipod, and two clips, and there are no batteries required. This is the perfect gun for ages 8 and up. It seriously brings on the intimidation factor. This exclusive gun is affordable, super cool-looking, and quite efficient. With the negotiator, you can fire 8 darts continuously from the 8-dart rotating drum. The darts that this gun uses are foam Nerf Doomlands Elite darts, and they come included with your purchase. Coming in at a reasonable price, the Negotiator does not require batteries and is suitable for ages 8 and up. With weight about a pound, the Negotiator is lightweight and easy to use. This is a Nerf gun that is only for the cool kids. The FlipFury has two separate barrels that hold up to 6 darts each. Fire up to 12 darts continuously without needing to stop and reload. You can easily flip the rotating barrels during your Nerf battle, and that means you can access a full round once your ammo from the other side is used up. With your purchase you receive 12 Zombie Strike darts for accurate and straight shots every time. This is a great gun for adult Nerf games, but it can also be used by children. Feel the surge with this cool gun that looks great and is top quality. With 15 darts, you can fire one after the other without needing to reload. The rotating drum of 15 darts allows for precise shooting up to 90 feet away. The Elite darts are included with your purchase. For this high-quality gun you’re going to pay a reasonable price, but keep in mind that it is heavier than the other guns, weighing in at 2.6 pounds. This is one of the most versatile Nerf guns on the market. The Tri-Strike offers 3 types of firing options which include standard, mega, and missile style. You can choose to use 1 type, 2 types, or all 3 types of shooting modes when you customize the gun. There are no batteries required for the Tri-Strike, and the design features a struck and horizontal grip for added stability and control. With your purchase you receive Mega dart barrel extension, missile launcher, 4 mega darts, 10 elite darts, and a 10 dart clip. Weighing in at 4 pounds, this gun runs on the heavier end of the scale. In our opinion, the very best Nerf gun on the market is the Strong-arm Blaster. This revolver-style gun features a rotating barrel which holds 6 Elite darts. Not only is the gun affordable, it works well with any type of Nerf dart. That means that if you have other darts in your Nerf collection, you can go ahead and load them into the Strongarm. This gun is famous for its rapid-firing capabilities. Shoot off one dart after the other at a range of up to 90 feet using the 6-dart Slam Fire blasting feature. Precision and fun all rolled into one, this gun is going to ensure that you have a fighting chance in every battle that you undertake. It’s okay when you run out of ammo, because the barrel flips open, making it quick and easy to reload to get you back onto the battle field as soon as possible. Most users agree that the Strong-arm is easy to hold and lightweight. Like most other Nerf guns, this one does not require batteries and it’s suitable for ages 8 and up. The ideal darts to use with this gun are the Elite darts, which are famous for precision and quality. They have a hollow, flexible tip and are made of foam. If you’re looking for efficiency, precision, and speed, this is the gun for you. Not only that, but it looks super cool and comes in at a reasonable price. If you’re looking to give a gift to a child or Nerf fan, this is the right choice. Keep in mind that this one is only suitable for ages 14 and up. The motorized gun uses 6 D batteries and can shoot up to 100 rounds. Your purchase comes with Nemesis MXVII-10K foam pellets which are designed to travel long distances while still being soft and safe to use. That means no bruises on your target. The top hopper feed makes this gun very easy to load and allows for seamless firing until the ammo is gone. Choose from either red or blue. If you have a number of these guns, you can form teams based upon color. The trigger lock and tactical rail make it safe and fun to use. Weighing 8 pounds, this is one of the heavier Nerf guns, and that’s why it’s not suitable for those younger than 14. This is for the intense Nerf wars that heat up your yard each summer. The Hammershot Blaster is one of the highest quality Nerf guns thanks to its sturdy frame and precision. It holds 5 Zombie Strike darts which come included with your purchase. Hammer action blasting is thanks to the sturdy trigger that prevents any accidental shots. The click hammer makes this gun easy and fun to reload. Weighing in at only 1 pound, this gun is ideal for ages 8 to 11. The Rhino-Fire is another top-rated Nerf gun that is turning heads. It manages to rapid fire Elite darts from two alternating barrels with speedy motorized blasting. There is a removable tripod that helps to steady your shots, and it holds 25 Elite darts in each of 2 separate drums. With your purchase you receive 50 Elite darts, and the required 6 D batteries are not included. The Retaliator is designed for destruction, but in a playful way. It comes with a 12-dart clip and fires darts up to 90 feet in distance. Enjoy the stock and barrel extension and 12 Elite darts that come with your purchase. There are 4 different configurations to this gun, and the removable stock gives you a steady shot that you can count on. There are a number of N-Strike accessories that can be added to this gun thanks to the top and bottom tactical rails on the barrel extension. The stability handle enhances your mobility, and your purchase comes with a 12-dart Quick Reload Clip. Although Nerf guns are fun and exciting, it’s important to ask yourself whether or not they’re safe. Parents can get a bit concerned when it comes to these kinds of toys, and that’s particularly true since some theories state that these guns can lead to future violence. Let’s examine whether or not you should have a Nerf gun in your home. The truth is that Nerf guns are very safe to use. They are made from lead-free materials and are designed with safety in mind. Darts and ammo for Nerf guns are made from light and safe foam that cannot do damage to the body. That being said, there are still some tips that you can take to heart to make sure that your Nerf experience is a safe one. Never look down the barrel of the gun. This seems like common sense, but it’s important that you tell your children this. Although the ammo is made of foam, it can still do damage to the eye at short distances. Similar to a real weapon, when it’s not in use you want to take your finger off the trigger and point the gun towards the ground. Although it’s safe to get hit by a Nerf gun, it can still be unsettling when there is an accidental firing and someone gets hit that was not expecting it. Instill in your children proper etiquette when using a Nerf gun. When the gun is not in use, it should not be loaded. Again, this is to prevent accidental shooting. One rule of thumb is that face shots should not be allowed. Teach your children that only aiming for the body is the proper way to use the gun. Always use safety glasses and masks. This should be non-negotiable. Goggles and safety glasses should be purchased separately and used during every Nerf war. No one should be allowed to fire a Nerf weapon at pets. It should also be forbidden to fire the Nerf gun at those who are not playing. Make sure that your kids are playing Nerf in a safe place. Ideally, that would be an enclosed backyard. There should be no opportunity to wander into the street or other dangerous area. If you’re having a Nerf war at your home, tell your neighbors. That’s not only to prepare them for the noise, but if your kids like to dress up in dark clothes and masks while having a Nerf war, it can seriously freak out your neighbors. For this reason, shoot the neighbors a quick text and let them know what’s going on to avoid any confusion. Never, ever allow the kids to paint the guns. They may be tempted to paint them black or with camo, but this is a very dangerous thing to do and can lead to confusion. Always adhere to the age requirements for each model of gun. It can be dangerous when someone’s age is not suitable. Make sure there are no alterations to the foam darts. They can never be weighted or changed in any way to make them more dangerous. One of the best rules of thumb is to respect those who are not part of the game. Someone who does not want to receive the blow of a Nerf dart shouldn’t have to. Instill proper etiquette so that your kids understand who is okay to shoot and who is not okay to shoot. It’s a matter of respect. As you may know, with a high firing rate Nerf gun the ammo runs out quickly. There’s nothing more annoying than being engaged in an intense Nerf battle, only to learn that you have to stop and reload. Most of these guns do not come with additional ammo, and that’s why it’s suggested that you buy additional ammo in order to keep the game going. The great thing about Nerf guns is that they have a high capacity and fire darts very quickly! But the upside is also the downside when it comes to Nerf guns. The good news is that it’s easy to purchase additional ammo on the Nerf website or Amazon. Make sure that you note what kind of ammunition your gun takes before you purchase. One thing that you’ll notice when purchasing additional ammo is that they all look the same. In general, they are cylinder-shaped, made of soft foam and with a rubber tip. The thing that really tells them apart is the color, which you’ll notice, there is a wide array of. Keep in mind that AccuStrike darts actually work with all Nerf guns, so if you’re at a loss, that’s what you need to get. The Mega dart is larger than the standard dart, and it makes a cool whistling sound as it’s flying through the air. Large darts add a lot of fun to Nerf battles, but sadly, they’re not as accurate as standard darts. 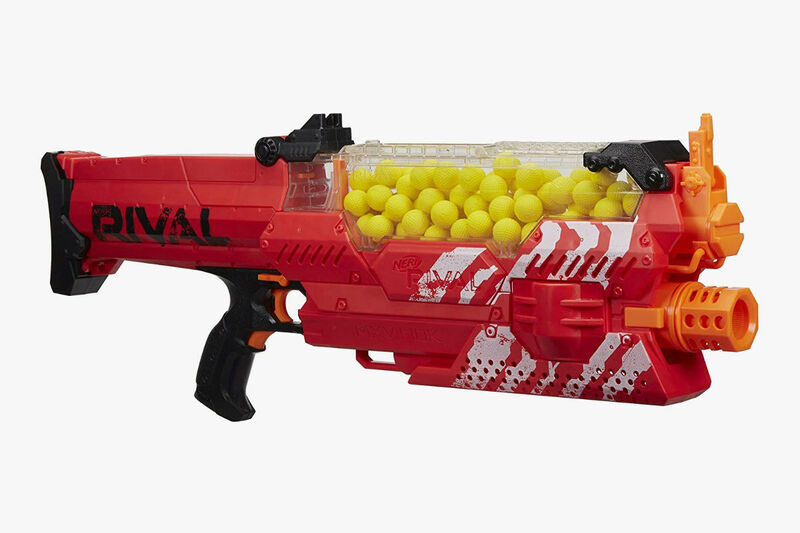 Note that the Nerf Rival Nemesis actually uses foam balls instead of darts, which adds a little variety to the battle. These balls are remarkably precise and safe, but they’re still only for those 14 and older. If you’re a Nerf Nerd, then you no doubt already know a lot about Nerf, but there’s always more to learn! We’re going to explore some fun Nerf facts that maybe you didn’t realize. Did you know that Nerf comes from drag racing? In the ‘60s, trucks were used to push drag cars to the starting line, and they had foam-covered balls on the front of the trucks. These were known as nerf balls, and they were meant to prevent damage to the cars. The same guy that invented Twister, Reyn Guyer, also invented the first Nerf product. It was a 4-inch polyurethane foam ball. Parker Brothers introduced it in 1970 as the world’s first indoor ball. Millions of them were sold in the first year. In 1970, the famous band known as the Monkees appeared in a Nerf commercial. “Throw it indoors; you can’t damage lamps or break windows. You can’t hurt babies or old people.” This was one of Nerf’s original ad lines. In 1972, the Nerf football rose to fame. It was invented by Minnesota Vikings kicker Fred Cox. Nerf basketball and baseball were soon to follow. Ever heard of the Power Drencher? You probably haven’t, because it was the original name of the Super Soaker. It hit the market in 1989, and was invented by aerospace engineer Lonnie Johnson. It was not until 2010 that the Super Soaker became a Nerf product. The first dart blaster was the Nerf Sharpshooter, and it was introduced in 1992. George Clooney has been known to prank people on the set using Nerf products. He’s known to fire a Nerf gun in between takes, and when he really feels feisty, he’ll keep one behind the camera so that he can shoot a fellow actor who has a bad take. Nerf has appeared in a number of television shows, including 30 Rock, The Office, Chuck, and Modern Family. You could circle the globe four times with all the Nerf darts that have been sold in the past 5 years. Nerf designers test prototypes in a number of recreated areas. That means that they have a huge warehouse with simulated dorm rooms, cubicles, bedrooms, and basements. Can you imagine running around a fake dorm room all day long testing a Nerf prototype, and getting paid for it? As funny as it sounds, not only is a Nerf gun a fun toy, but it’s also a good way to teach children gun etiquette. Also, they’re perfectly safe, fun to use, and there are a number of varieties on the market to choose from. You may get overwhelmed in your search for the perfect Nerf gun, but rest assured that with a little research you’re sure to find something that is perfect for the whole family. When considering various products, take into account their price, size, weight, style, and the amount of ammo that they hold. It’s always important to adhere to the age requirements when it comes to a Nerf gun, and follow our safety suggestions as closely as you can to ensure that your Nerf wars are prosperous and without casualties. For decades, Nerf has mastered the art of allowing kids to play inside and have fun, but over the years their products are geared towards indoor and outdoor wars. Whether you agree with the ethics of Nerf toys or not, you can’t deny that they’re superior to video games. Nerf guns encourage your children to get outdoors and get moving. They inspire competition and teamwork, and they are designed to keep everyone safe in the process.